Our precision fittings offer safe and leak free connections from cartridges to barrels and feed tubing. 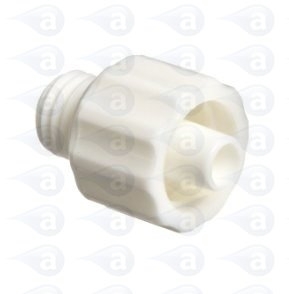 This useful adapter fitting attaches to our range of cartridges for direct use of small dispensing tips and other fittings. It is also used on valves. Male luer lock fitting to 1/4-28 UNF thread. In high density nylon. Suitable for use with dispense valves and tubing and compatible with most adhesives, solvents, inks, gels, chemicals, silicones, primers and activators. Supplied in a pack of 5. 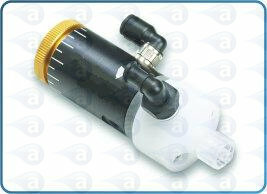 Use as a tip adapter fitting on TS5620HU, TS5622VD, TS5622VU and TS5622VT diaphragm valves. All fittings are 100% silicone free plastics and are safe for use to 100 psi pressure. Summary: Metal fitting for valve or other fitting attachment. Typical Applications:- Thread for use with dispensing valves. Use with most liquids, pastes, epoxies, gels, solvents, adhesives, fluxes, lubricants, paints, inks, solder creams, braze pastes, UV cure and many more assembly fluids.